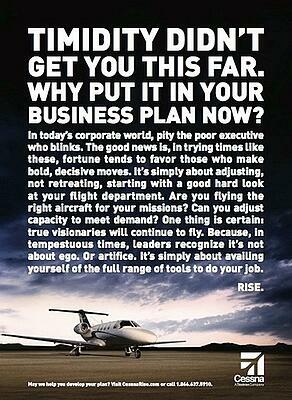 Cessna has just launched a new advertising campaign - and I LOVE it. Cessna gets who their customer is, and they're not worried about anything else. It reminds me of what Thomas Baldwin, CEO of Morton's, said about staying focused on the things you can control. 2. The only stance that provides any chance of success is an assertive, confident one. Difficult times call for leadership. Leadership requires risk. Leadership, by it's nature, is positive. In difficult markets, you must embrace the negative and stay positive. Recessionary markets are not for the meek or the weak of heart. Succeeding in a recession requires focus, confidence, aggressive action, and taking the long view. It's not about winning the battle - it's about succeeding in the war. Cessna gets that if they don't drive an agenda they lose by definition. Now think about this for a moment - what percentage of people in the country fit the psychological profile of a Cessna buyer; and have the need and ability to buy? Maybe .01%? If that's the case, that's the entire universe Cessna should pay attention to. 99.99% of market opinion doesn't manner. What's more - what if Cessna is being delusional? What if Fast Company is right and it's foolish to buy a private jet or use Cessna's services right now? There would be no point. Andy: You know what the Mexicans say about the Pacific? Andy: They say it has no memory. That's where I want to live the rest of my life. A warm place with no memory. For those who have seen the movie, you know that Andy did not lose his will; as in the next scene Andy escapes. So how are you talking? Are you talking the language of living; or are you talking the language of dying? Cessna is clearly talking the language of living - and it's the only language that makes thriving possible.